You’ve read your kids every book you could find by Maurice Sendak and Dr. Seuss but they’re not quite ready for the Harry Potter epics of J.K. Rowling. So what do you read them in the meantime? 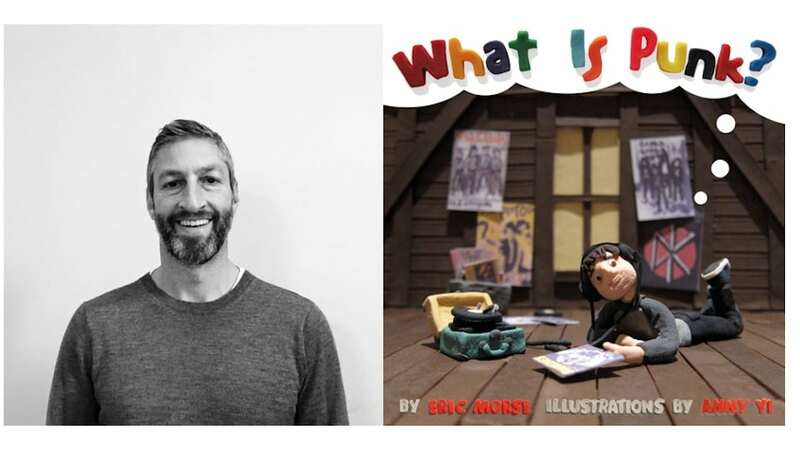 Might we suggest Eric Morse’s What Is Punk?, an enjoyable picture book that recounts the history of punk rock… in verse. After all, it can only help every youngster’s cool factor later in life if they know who Television and the New York Dolls are, right? Find out below just how this all-ages homage to punk came to be. Q: Your picture book What Is Punk? is at once delightfully playful and impressively comprehensive about the history of punk. How long did it take to come up with the final copy? Did you have to research this or was this all well-known to you beforehand? A: A quick hard drive check reveals 24 drafts over an 11-month period. I had what you might call an “enthusiast’s” knowledge of the material: I had my favorite albums/songs/eras for each artist — as I’m sure your readers do. I’m not a punk scholar or historian, I’m a punk fan, and the book was intended to be one person sharing something he loves with others, as opposed to an encyclopedic document. The main research I did was fact-checking, getting dates right, going deeper into correlated bands and scenes, etc. But in a 32-page children’s book, there isn’t a lot of room to get into deep detail! The most labor-intensive portion was working with the rhyme scheme and narrowing down the artist list. Q: Who was your favorite punk rock band growing up? Did you have a particular record that you basically played to death? A: Oh, my car stereo wore out plenty of tapes when I was growing up. Punk was present in my teenage life in strange ways: my first concert featured Johnny Rotten and Keith Levene (original bassist for the Clash) playing with Public Image Ltd.; a Clash cover band played at my prom. But it wasn’t until the ’90s when I truly threw myself into the original punks. I think I will always be drawn to The Clash — as evidenced by the fact that, no matter my mood or my activity, I immediately stop what I’m doing if a Clash song comes on and turn it (way, way) up. I appreciate their creative depth and breadth, and their political bent. Some other personal favorites unfortunately ended up on the cutting room floor: I love the Buzzcocks, and Anny is a die-hard Dead Kennedys fan, so we had some real heart-ache during the process! Q: In your sequel What Is Hip-Hop?, you give shout-outs to Queen Latifah, Missy Elliott, Salt-N-Pepa, and Nicki Minaj. If you were to add one more woman hip-hop artist to the book who would that be? A: That’s tough; Lauryn Hill in the Fugees was one of the best of her era! But I’d have to go with MC Lyte. We originally intended to keep her in the book, but eventually had to cut her section (along with several others) to fit everyone else in. If you ask me, MC Lyte is still an all-time great! Q: If you were going to do a third book in your What Is… series, what might that be? Related: Check out our Deconstructing the Beatles series of DVDs. Q: Your wordplay seems clearly inspired in part by Dr. Seuss. Do you have a favorite Dr. Seuss book? A: I’m a sap, so I’ve always been a sucker for Oh, The Places You’ll Go! I’m also an aging sap, so my current bittersweet favorite would have to be You’re Only Old Once! Q: How did the Spanish-translation version of What Is Punk? come about? Spanish is actually the second of three foreign language translations (plus the British version of What Is Punk?). It’s also in Turkish and Korean! Spain’s Flow Press Media, based in Barcelona, is a very cool publisher that has put out books on music, design, and pop culture from all over the world. They’re well familiar with my publisher, Akashic Books, and they reached out to Akashic to make the deal. I couldn’t have found a better vehicle for these books in the Spanish-speaking world than Flow Press. Q: What can you tell us about your writing outside the world of children’s lit? A: There have been two through lines in my career over the past quarter century: music and writing. I started out writing about music for The Stranger and Seattle Weekly in Seattle in the ’90s, and I founded an online magazine about art, music, and literature in the early 2000s. From copy writing to freelance lifestyle and business stuff, my writing has kind of been all over the map. It’s appeared in Huffington Post, MTV.com,… Nowadays, my writing tends toward political commentary (Spoiler alert: It would not be welcome in a Trump publication! ), but I will never tire of sharing my musical passions with kids. Editor’s Note: To order your own copy of Eric Morse’s What Is Punk?, click here. 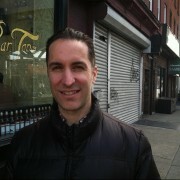 Photo Credit: Image of Eric Morse courtesy of the author. Drew Pisarra is obsessed with Korean movies, Gertrude Stein and off-off-Broadway. His Instagram account is devoted to public art. You can follow him there and on Twitter at @mistermysterio.